The first in-depth monograph on the important paperback artist (1912-2005). A Biography. Over 150 paintings (and paired with their respective covers). Photos. Avati Cover Art Bibliography. Preface by Stanley Meltzoff. James Avati (1912-2005) is regarded as the pre-eminent painter of paperback covers in the second half of the 20th century. He was known in the business as the 'King of the Paperbacks'. Avati designed realistic cover illustrations for novels by the likes of Steinbeck, Faulkner, Salinger, Caldwell and Moravia, covers that appealed directly to broad sections of the population. He worked for the New American Library (Signet Books) and for every other major paperback publisher including Bantam, Avon, Pocket, Fawcett and Dell. In this lavishly illustrated book graphic designer Piet Schreuders reconstructs Avati's life and 40-year career. 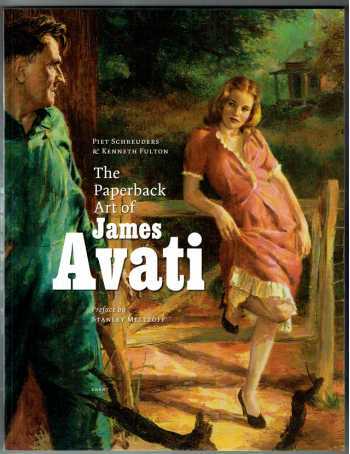 During the past 25 years most of Avati's original paintings have been salvaged from the warehouses of American publishers and now fetch many thousands of dollars among collectors. Here, for the first time, Avati's universally admired work is available in full-size quality reproductions and expertly described.